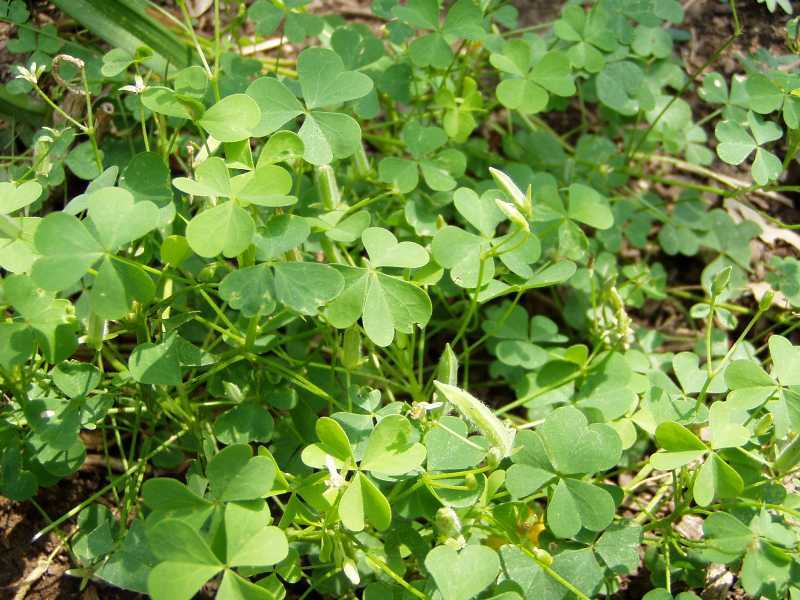 A weed is a plant that is not valued where it is growing and is usually of vigorous growth, especially one that tends to overgrow or choke out more desirable plants. Summer annual weeds emerge in the spring or early summer, grow during the summer, produce seed in mid to late summer, and are killed by frost in the fall. 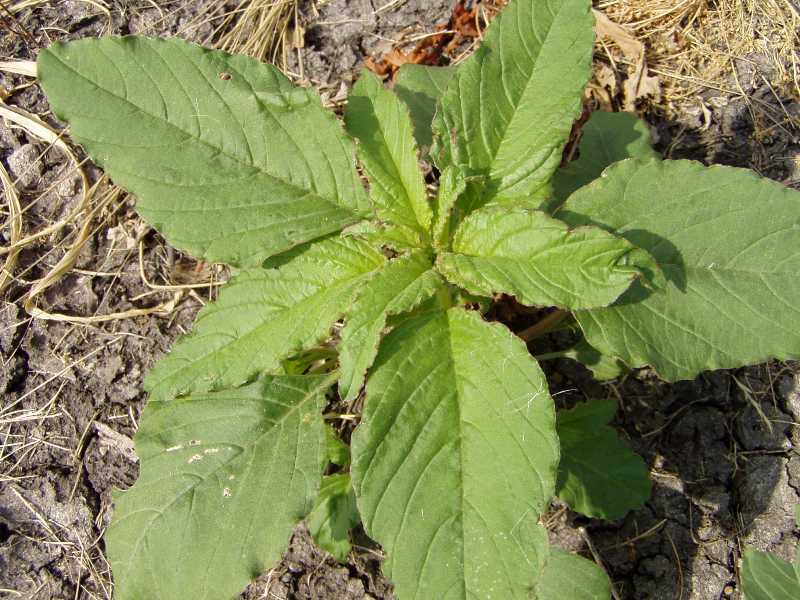 Following are some of the more common summer annual weeds for the St. Louis area. General control measures are listed at the end of this article. Barnyardgrass (Echinochloa crus-galli) is a summer annual grass that germinates from seeds from late winter or early spring throughout the summer. The stems are usually erect, thick, without hairs, often branched at the lower nodes, and may be tinted red to maroon at the base. The stems may reach 5 feet in height. The smooth, hairless leaves are rolled in the bud and contain neither ligules nor auricles. 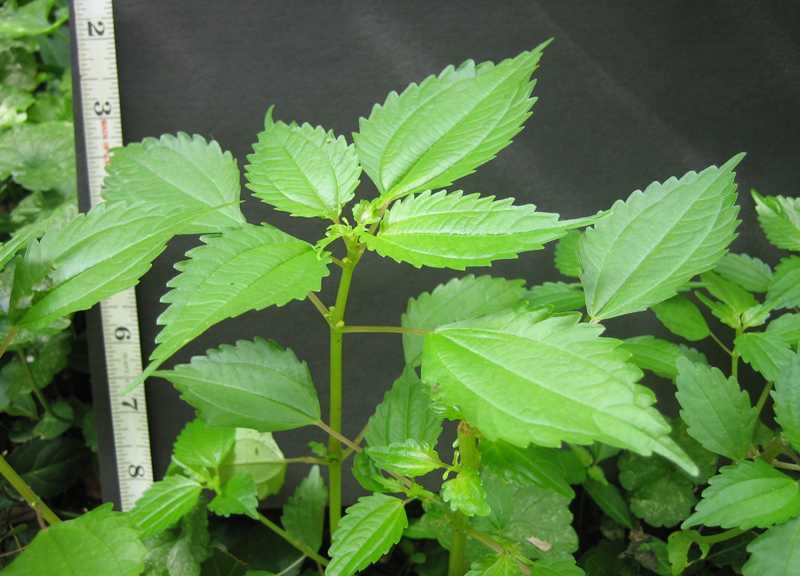 The dark green leaves, which range from 4 to 20 inches in length, have a distinct white midvein range. 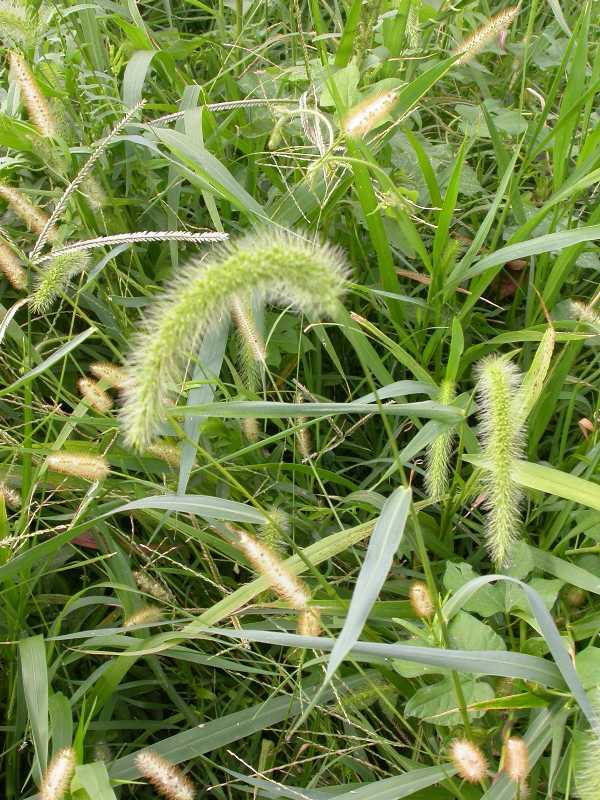 The seed head is green to reddish purple, with conspicuous, short stiff bristles or barbed spikelets. The roots are fibrous. Under close mowing, the broad, compressed purple sheaths of barnyardgrass lie flat on the ground and spread in a semicircular pattern. Barnyardgrass is found in moist soils, especially soils high in nutrients. Crabgrass, large and smooth (Digitaria sanguinalis, Digitaria ischaemum) are pale green summer annuals that has a prostrate or ascending growth habit. 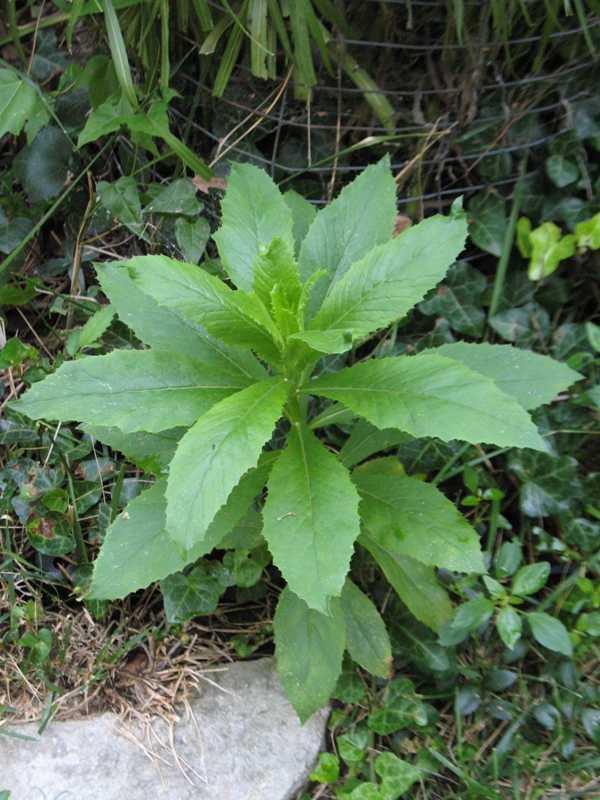 The two main species of crabgrass that occur in Missouri are smooth and large. Smooth crabgrass may be distinguished from large crabgrass by the absence of hairs on the leaves and sheath. Also smooth crabgrass does not root at the nodes like large crabgrass. Both species have a long, jagged membranous ligule and have no auricles. Crabgrass forms dense, unsightly patches that smother desirable turf grasses. Germination occurs when soil temperatures consistently reach 55 degrees F and is generally killed at the first frost. 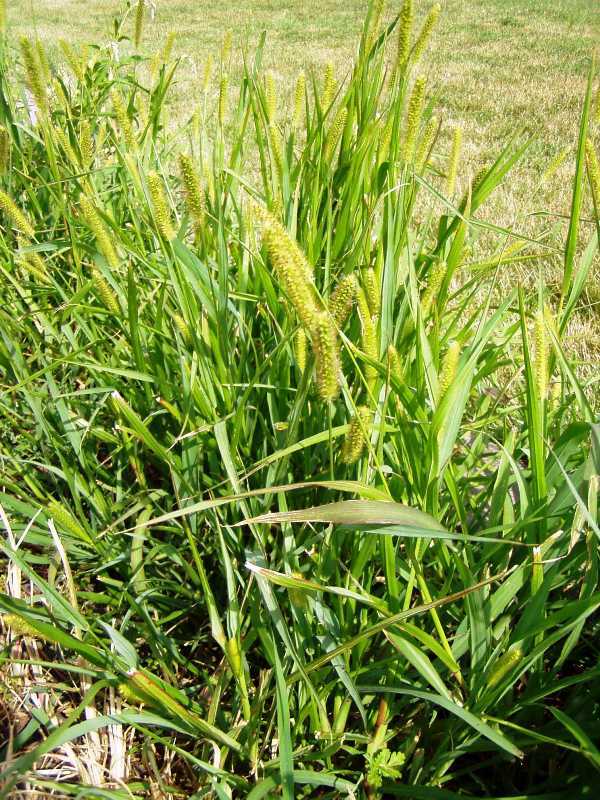 A crabgrass plant which needs warm soils and sunlight can produce 150,000 seeds. The seed head is composed of 2-6 branches (spikes) at the top of the stems forming 2 rows along the spike. To control early in the season, use a pre-emergent herbicide as soon as soil temperatures reach 55 degrees F for a period of four days about the time forsythia blooms. 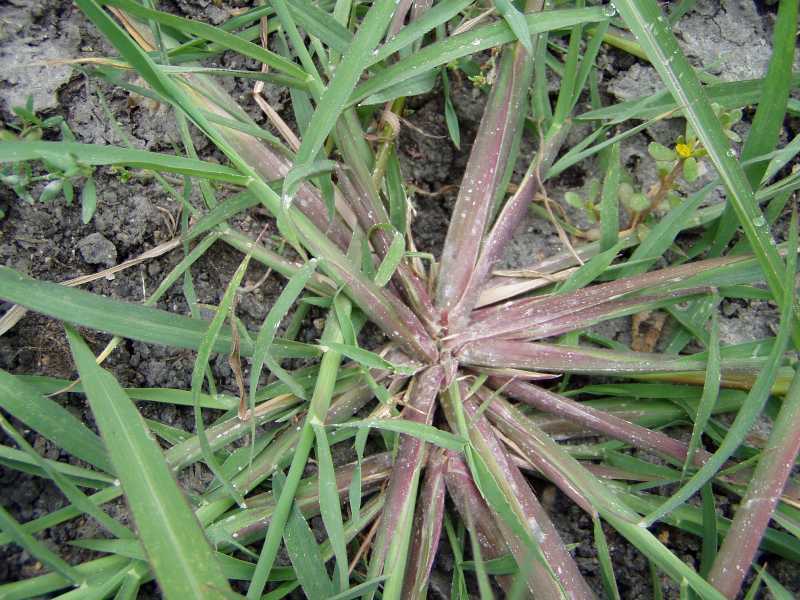 A pre-emergent herbicide is recommended even if some crabgrass plants have germinated. There will still be crabgrass seed in the soil and the herbicide can prevent further infestation. Do not aerate after a pre-emergent herbicide application. For crabgrass control after germination, use a post-emergent selective grass herbicide. Fall panicum (Panicum dichotomiflorum) is known as smooth witchgrass. It has a zigzag appearance as the buds turn out at the nodes. It has a very rounded stem, grows to 7’ and there is a purple tinge to its inflorescence. Sometimes it is confused with Johnson grass or barnyard grass, but fall panicum has a hairy ligule. Also its first true leaf has hairs on the underside of the blade, Johnson grass and barnyard grass do not. Panicum capillare is known as witchgrass or tickle grass. Culms are erect or spreading at the base. They are hollow, and pubescent at the nodes. They grow from 8 to 28” inches tall. The inflorescence is often ½ the length of the entire plant. It is purplish at maturity. It is softly hairy and the seeds are 1/16 of an inch. The head breaks off easily and rolls away in the wind, like a tumbleweed. 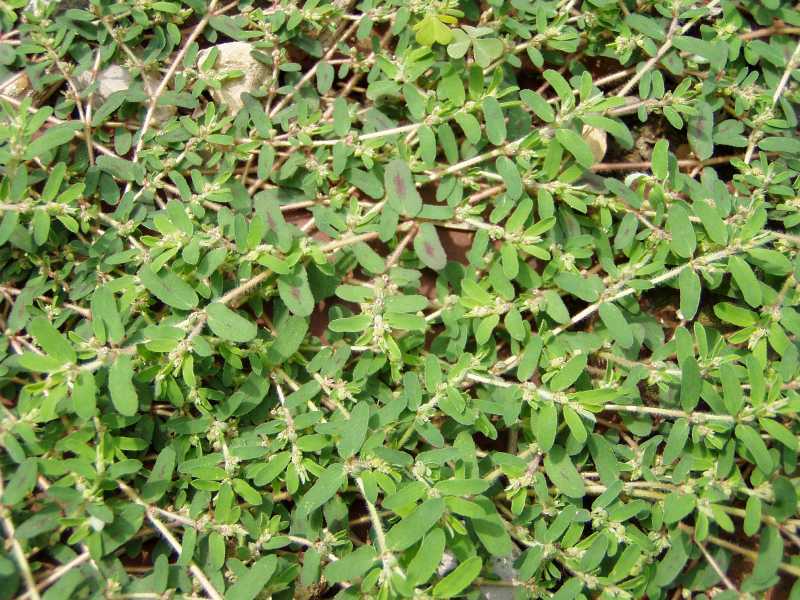 Goosegrass (Elusine indica) is a prostrate-growing summer annual weed that grows in a clump. 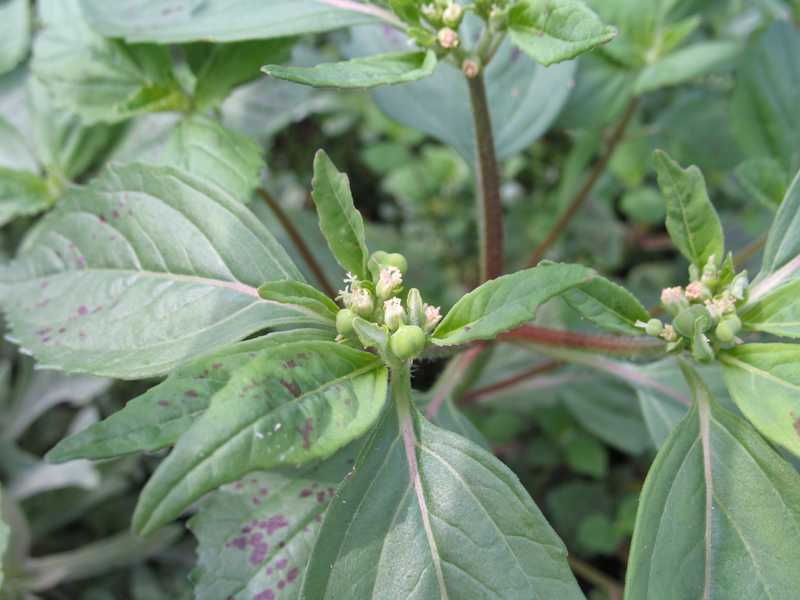 The leaves are distinctly folded in the bud and may be smooth or have a few sparse hairs at the base of the leaf. Goosegrass can be identified by the whitish stems at the base that are extremely compressed and flattened. The ligule is toothed and membranous with a cut in the center. There are no auricles. Goosegrass seed heads contain 3-7 spikes that form at the tip of the stalk. The seeds are attached in a zipper appearance on the spike. 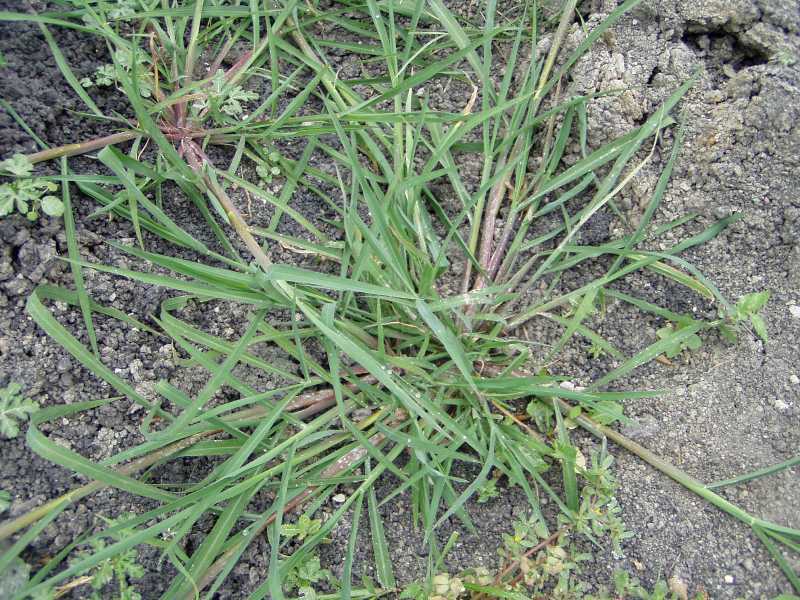 Goosegrass germinates about two weeks later than smooth crabgrass. 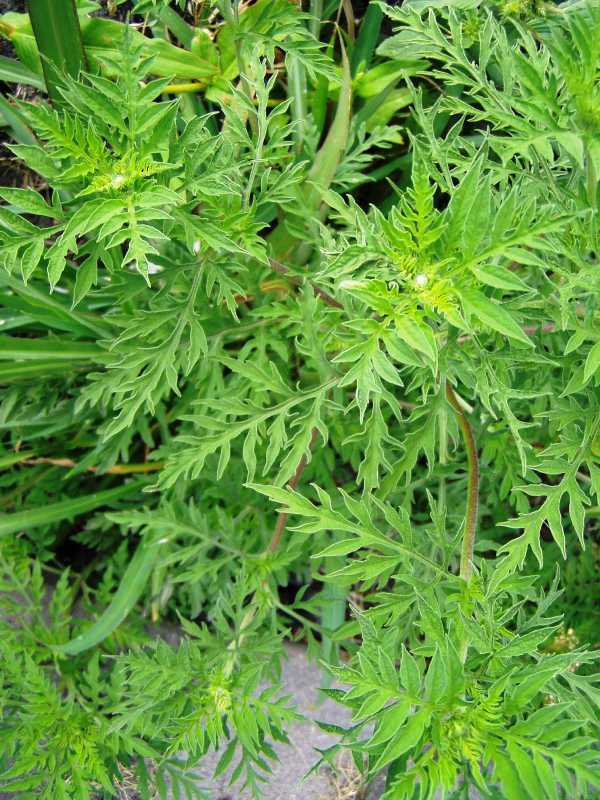 Goosegrass can tolerate heavy traffic, dry compacted soils and low mowing heights. Sandbur (Cenchrus longispinus) is a low-growing summer annual weed which is found in dense spreading patches most commonly in sandy soils. It roots at the nodes on the stems if they touch the ground. 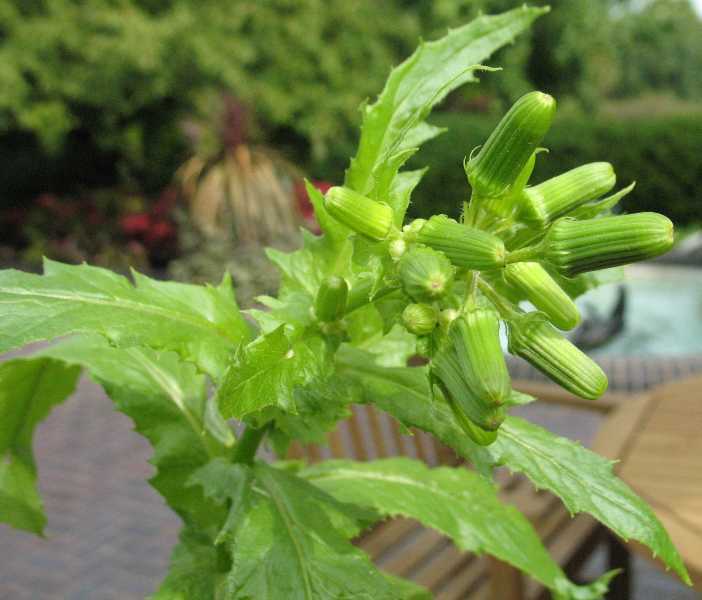 The leaves are folded in the bud, ¼ inch wide, and tapering to a point. The ligule is a short fringe of hairs and the auricles are absent. The seed head is a single spike with 6 to 20 rounded burs which contain 2 seeds in each bur. Sandbur seeds catch on clothing and animal fur and the barbed burs can easily pierce the skin and cause injury to livestock and people. Plants growing low to the ground can still produce burs. After a frost, entire plants become straw-colored, but stems with burs can persist through the winter. 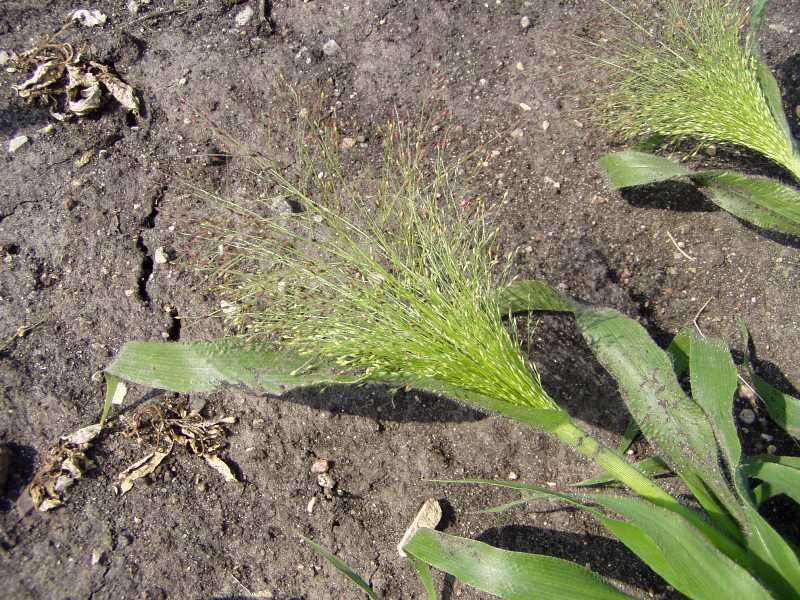 Seed dispersal occurs by animals, farm equipment, tires and in contaminated hay. Water is also important for seed dispersal, as burs float and may be carried for miles in irrigations ditches and other waterways. 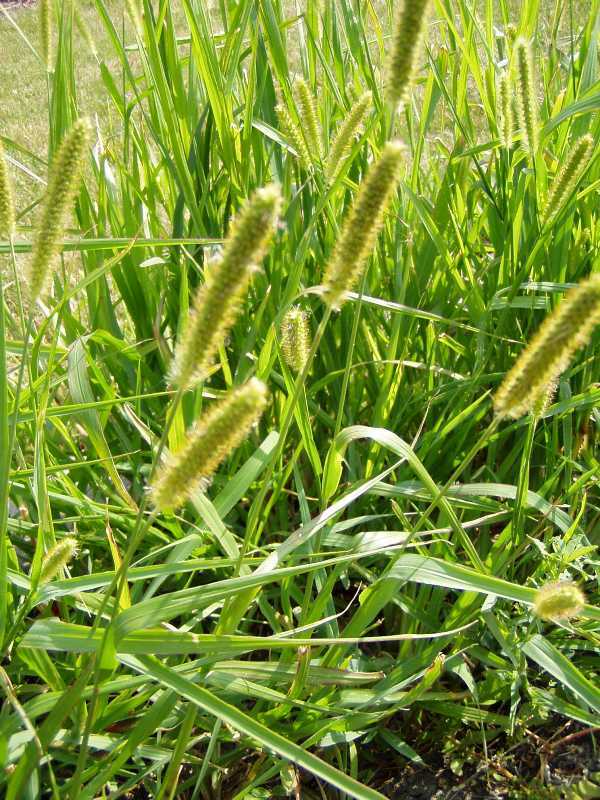 Yellow foxtail (Setaria glauca) is a summer annual found especially in the Midwest and Eastern parts of the United States. It germinates when soil temperatures reach 65 degrees. Leaves are rolled in the bud. The ligule is a fringe of hairs. Auricles are absent. The collar is narrow and continuous. The blade contains hairs near the ligule. It has an upright growth pattern. The seed head is a bushy spike which resembles the tail of a fox. Black medic (Medicago lupulina) is a summer annual that can act as a perennial. The leaf is similar to other legumes, but the center leaflet is on a separate petiole. The flower is a compressed cluster of bright yellow flowers in the shape of a globular spike on short branches. 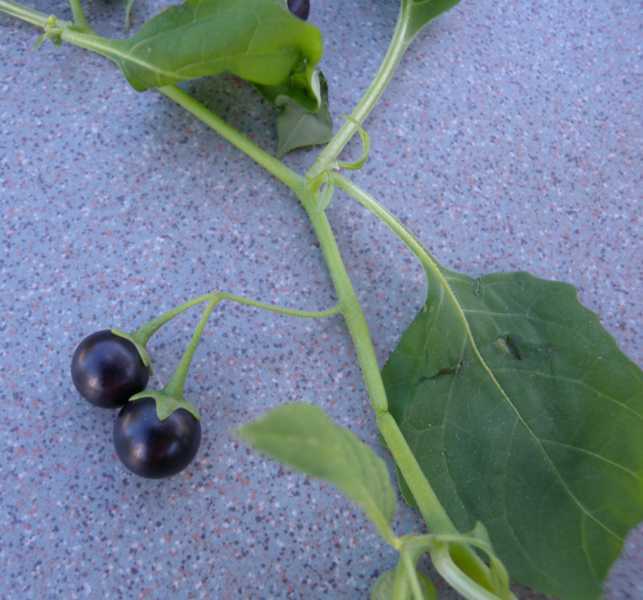 The seed pod turns black at maturity. It will produce seeds at normal mowing heights. It can be confused with lespedeza (Kummerowia striata) unless it is blooming. Lespedeza has a bright blue flower. Carpetweed (Mollugo verticillata) is a summer annual with smooth prostrate branching stems forming circular mats. 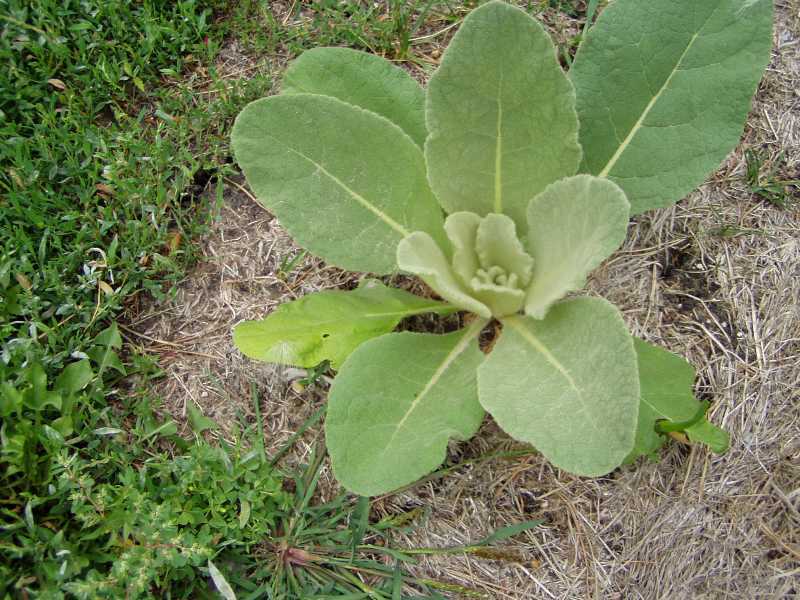 It is light green in color, the leaves are lanceolate in shape, widest in the middle and narrow at tip and base. Leaves form whorls containing 3-8 leaves. 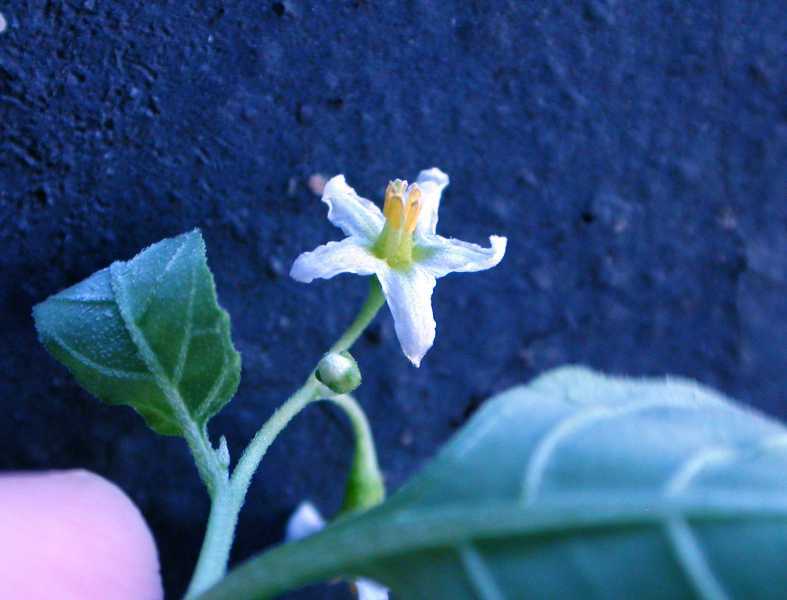 The flowers are white, have 5 petals, and form clusters of 2-5 flowers. Flowers are formed in the leaf axils. It spreads by seed, and is found throughout North America. 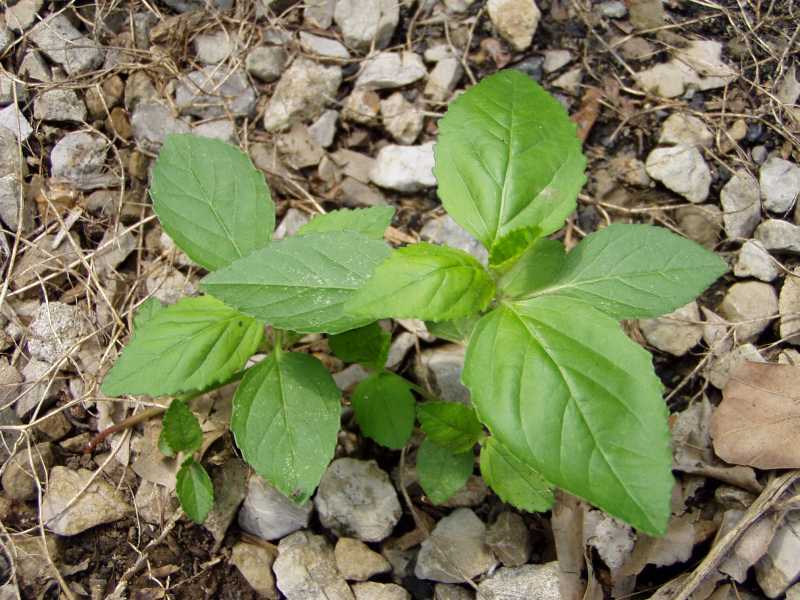 Carpetweed germinates much later than other summer weeds. It grows quickly, especially in thin turf. Mowing misses it. It prefers rich moist soils, but it can establish itself in dry, sandy soil. 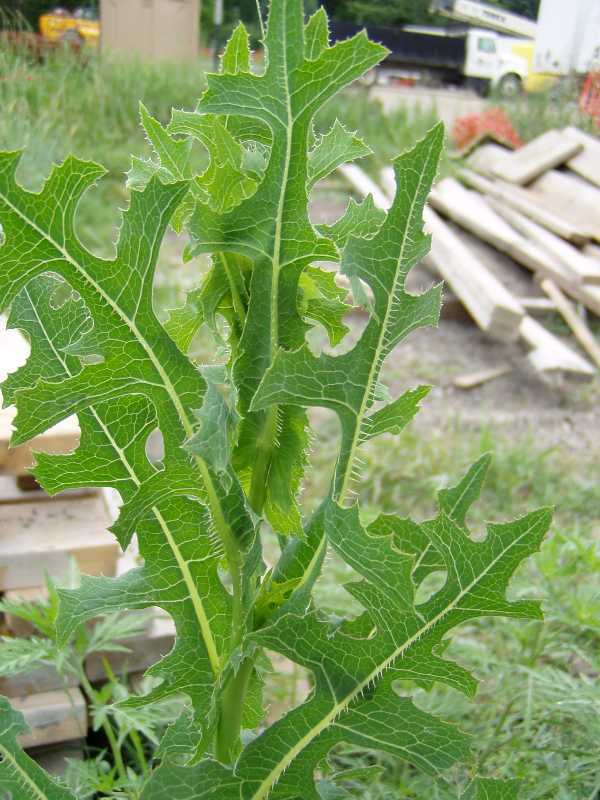 Lambsquarter (Chenopodium album) is an erect growing summer annual that may appear highly branched in a mowed setting. The immature leaves appear to be covered with a white mealy substance, especially on the underside of the leaf. 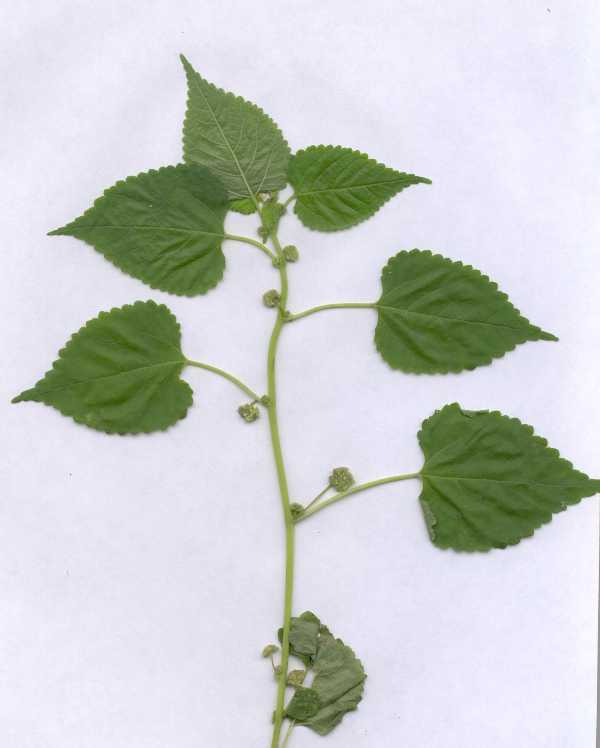 The first pair of leaves are opposite, and subsequent leaves are alternate along the stems. Leaf margins vary, but usually are irregularly lobed. 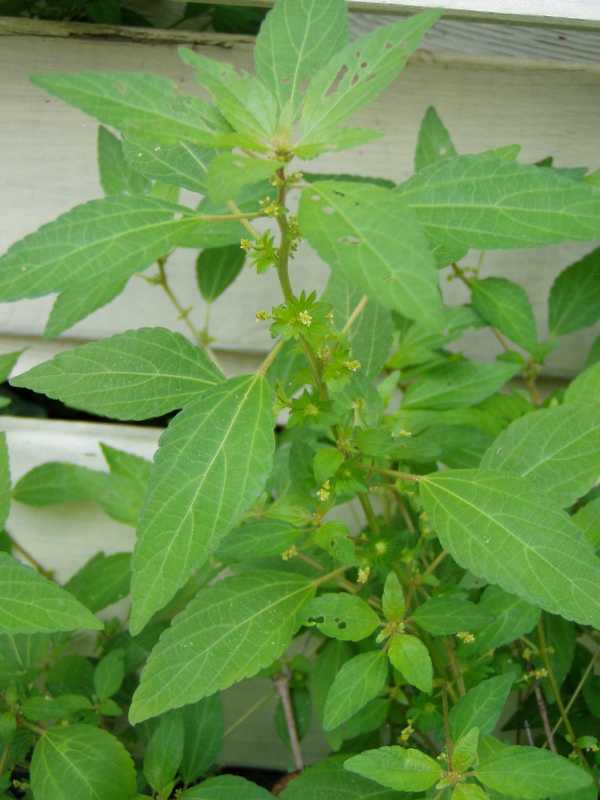 The root of lambsquarter is a short, branched taproot. 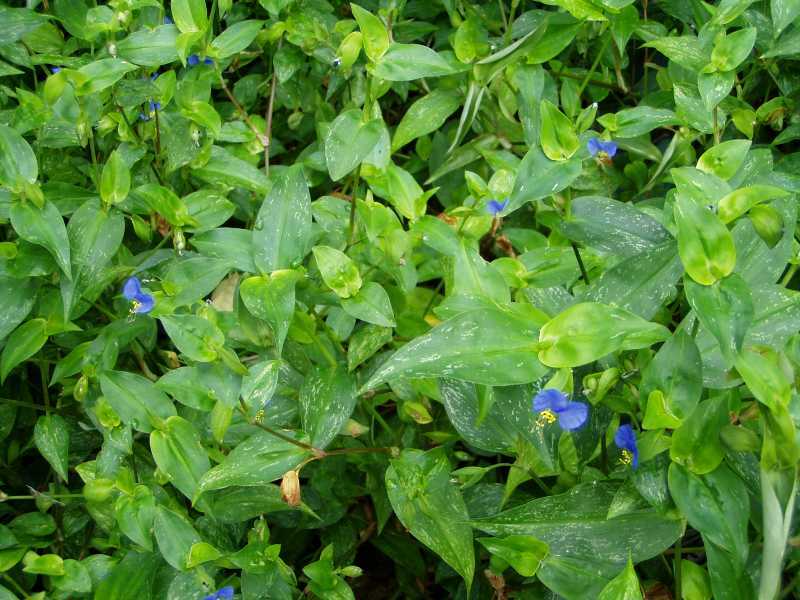 The flowers are found in small green clusters and lack petals. The clusters of flowers form in terminal spikes. 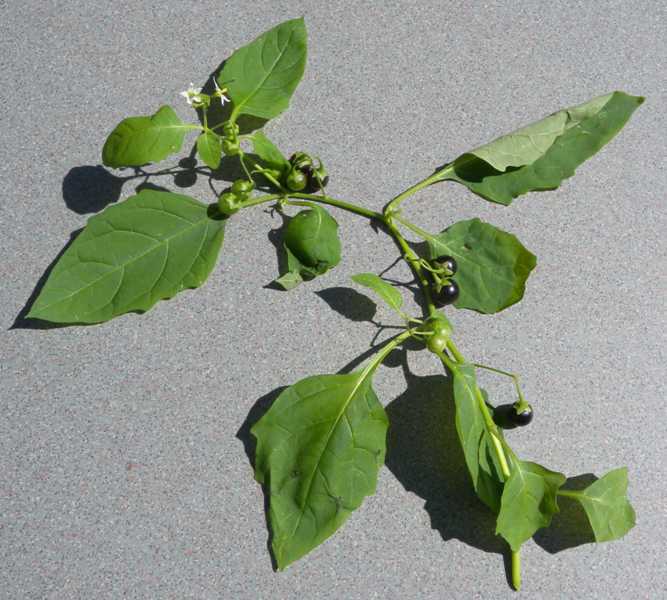 Lambsquarter spreads by black seeds that germinate in the late spring to early summer. Each plant produces thousands of tiny seeds that may remain viable for years. 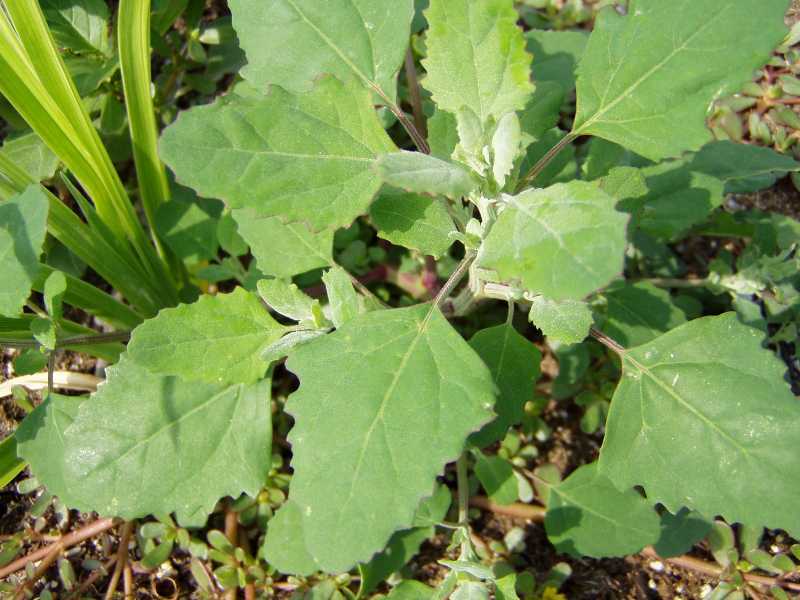 When lambsquarter is abundant, it is reported to cause hay fever symptoms. Mallow (Hibiscus trionum) is a summer annual-- it is also called “flower of an hour”. 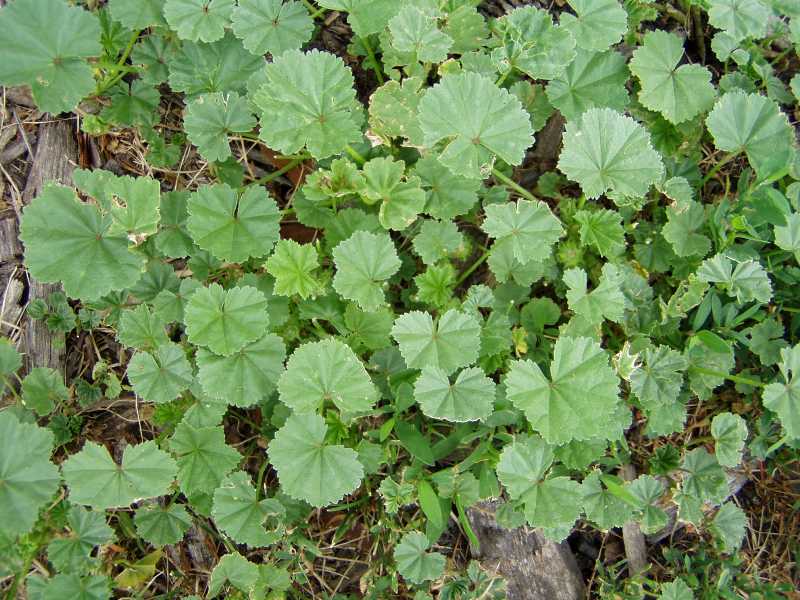 There is a winter annual mallow, it is usually called the common mallow. H. trionum is grown in Europe as an ornamental. It is upright 10-18”. It is covered with hairs. 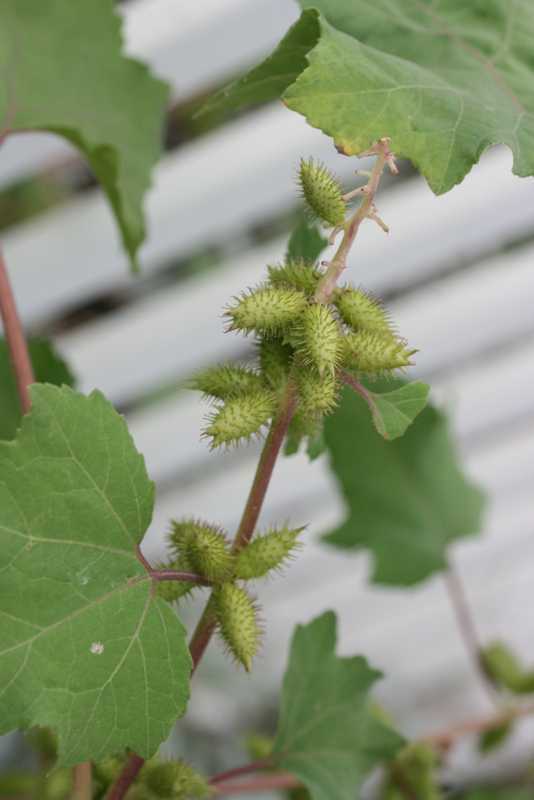 The leaves are deeply cleft with 3-5 coarsely toothed lobes on long petioles. The lower stems and petioles are red to purple in color. It has a fibrous root system with a weak taproot. It has a showy flower. It is light sulfur-yellow in color with a deep red to purple center. It does last 2-3 hours then the petals drop. It spreads by seed. The seed can be dormant for 50 years. 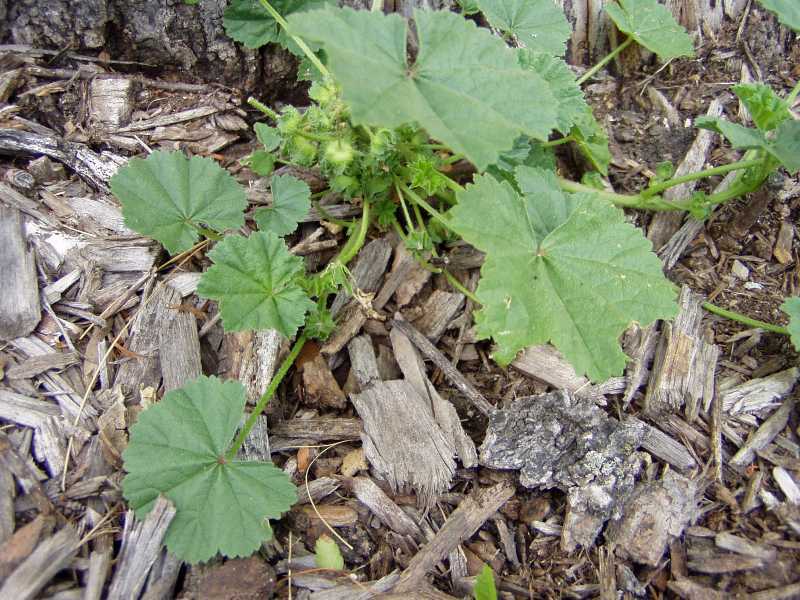 It is found throughout the U.S. Mallow can infest nurseries, orchards, roadsides, cultivated fields and open areas. It tolerates drought, alkaline soil, and gravelly soils. Pigweed is actually toxic to pigs and cows. This summer annual has alternate leaves. 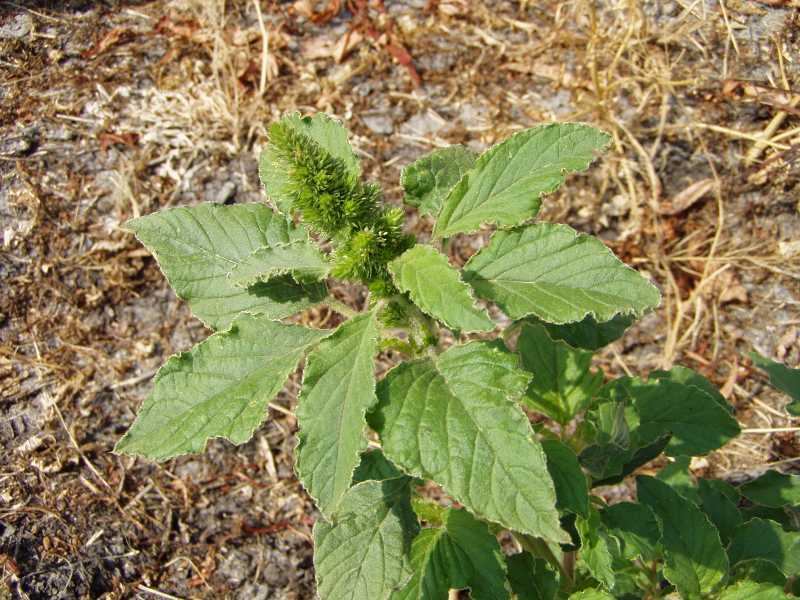 There are 10 pigweeds (Amaranthus) identified through the corn belt area: redroot, smooth, rough pigweed, Powell, tumble, prostrate, spiny, tall, sandhill and another one. The difference is in the flower. 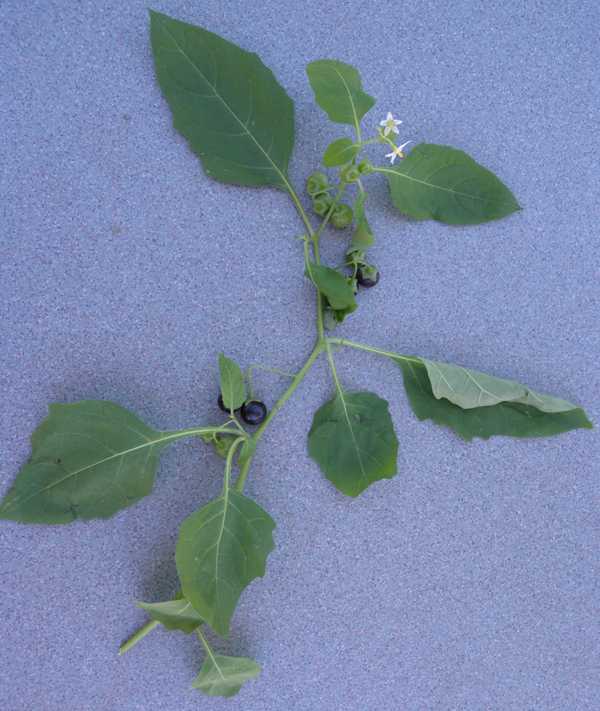 The leaves are alternate, the seeds (1/25”) are shiny, round and flat. 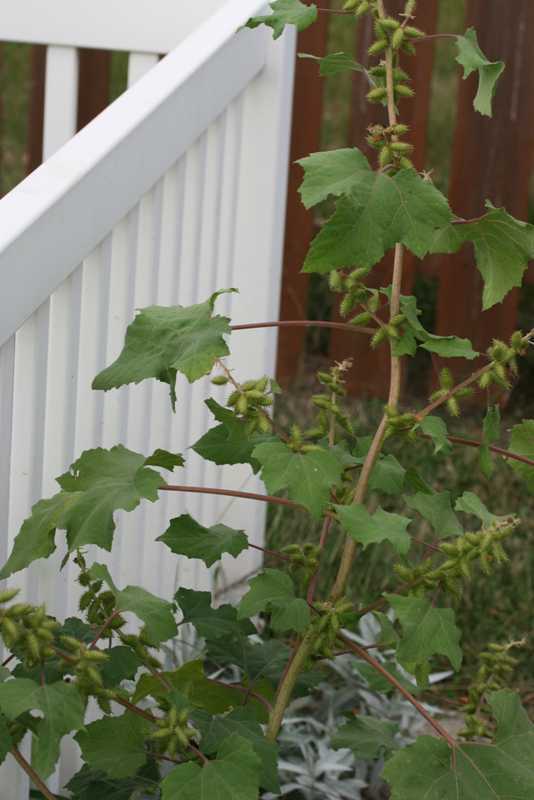 The plant can reach 2-4’ for the smaller ones and up to 61/2’ for the larger ones. 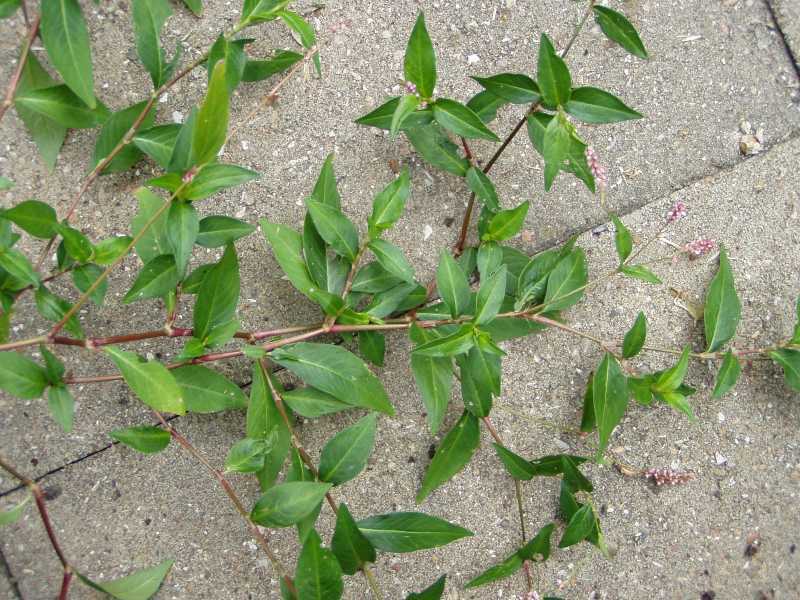 Prostrate knotweed (Polygonum aviculare) is a summer annual which resembles a grass with long, dark leaves as the seedling emerges. Later, it forms a flat mat up to 2 to 3 feet in diameter on slender wiry stems that emerge from a tap root. There are papery sheath or ocrea at each node that give the stems a knotted or swollen appearance. 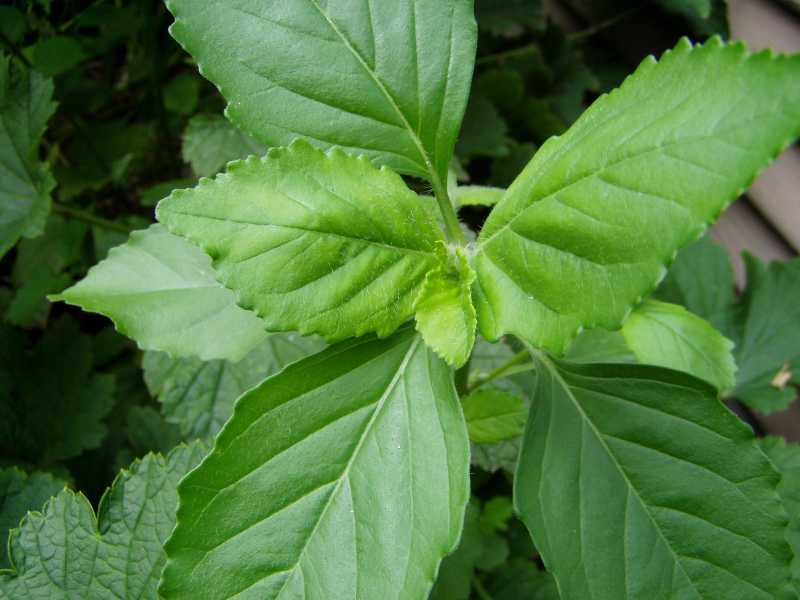 The alternate leaves are small and narrowly oval, dull and bluish green, and 1 ¼ inches long by 1/3 inch wide. 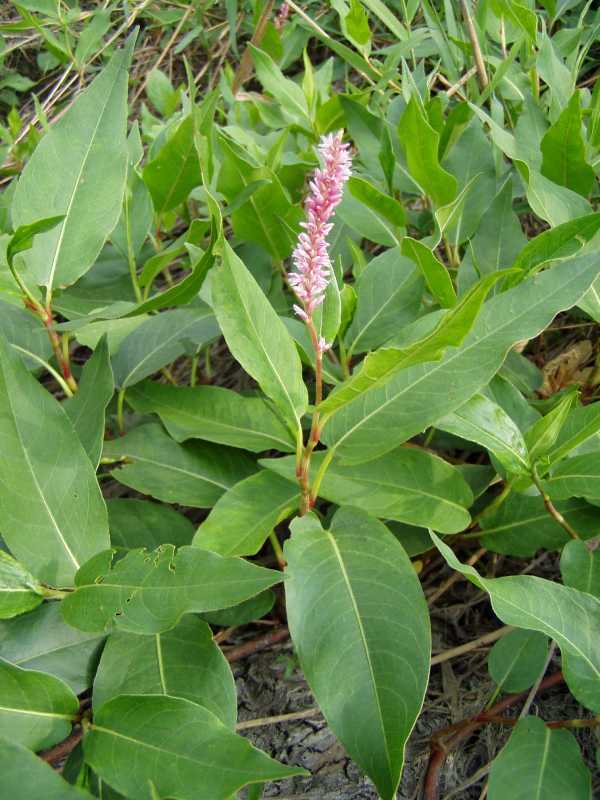 The flowers are small pink to white and form in clusters in the leaf axis. 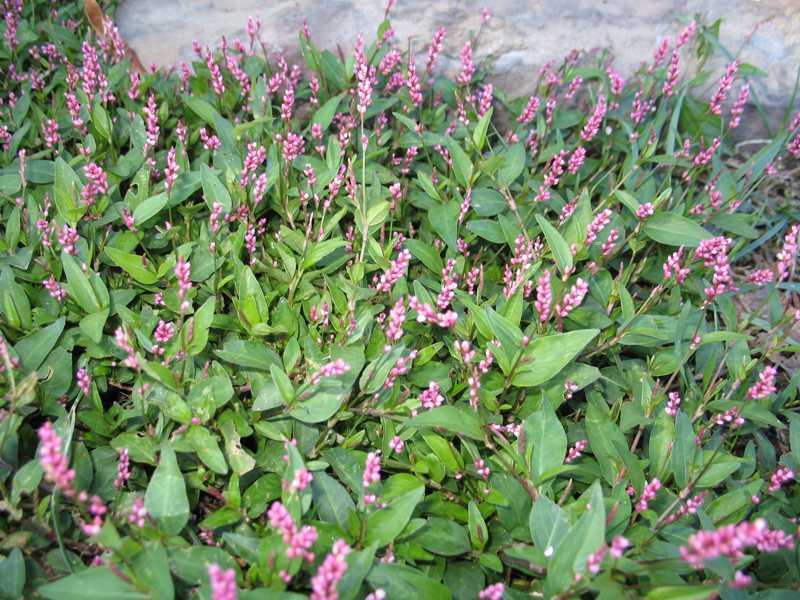 Knotweed is found in compacted, infertile soil or thin turf in the sun. 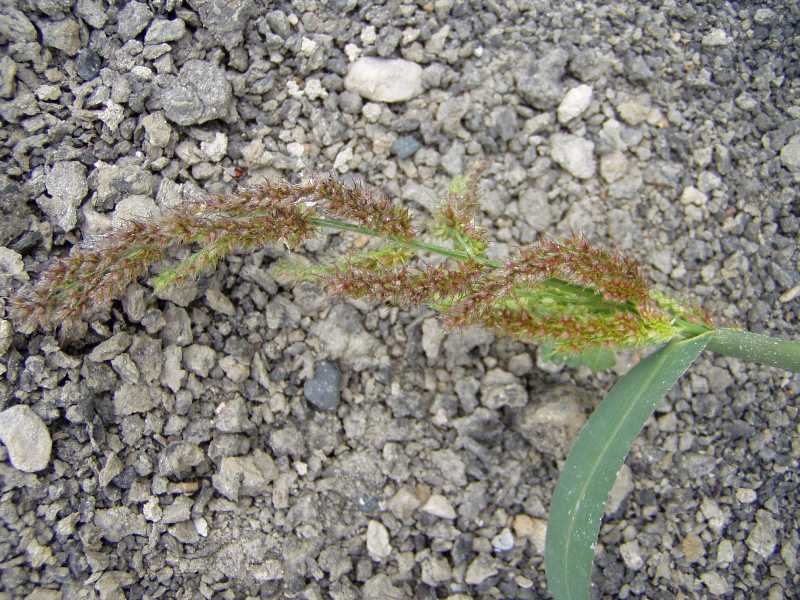 Smartweed is a close relative of knotweed, but it has a purple ocrea encircling the stem. Spotted spurge may be confused with knotweed, but the spurges do not have an ocrea and emit a milky sap when cut, unlike prostrate knotweed. 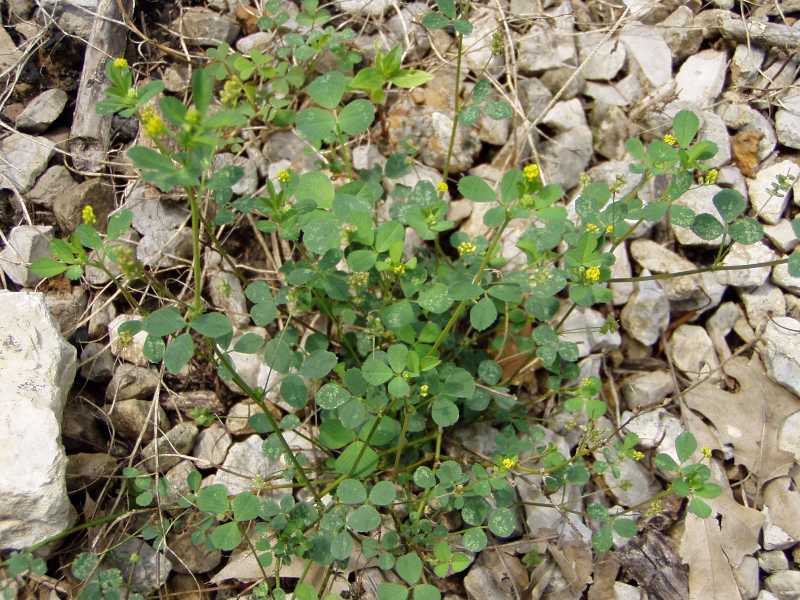 Puncturevine (Tribulus terrestris) is a summer annual weed with multiple stems prostrate along the ground. Stems may be up to five feet long originating from a taproot. 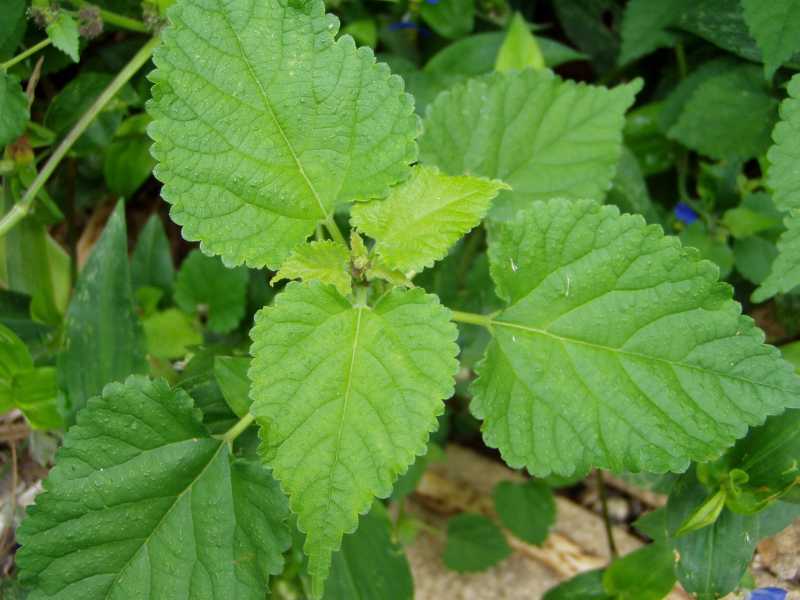 Leaves are compound pinnate with four to eight pairs of hairy leaflets. Each leaflet is less than ½ inch long. 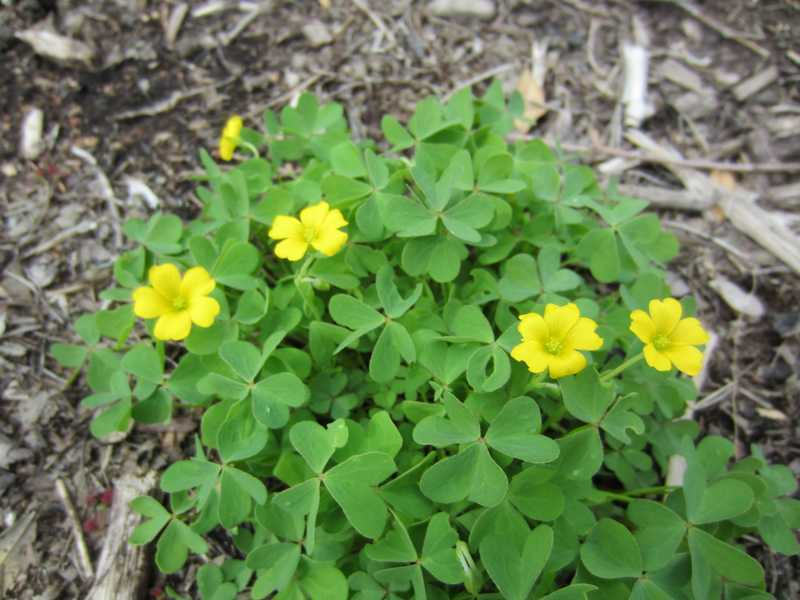 The small yellow flowers have five petals and are about 1/3 inch wide. 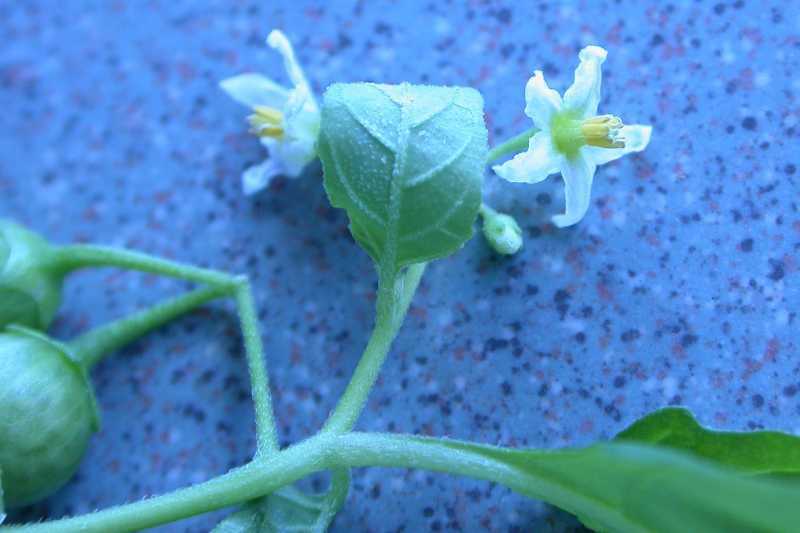 The flowers, which consist of 5 petals, produce hard, spiny, five-lobed fruit. Bloom is in late spring and early summer. At maturity the fruit breaks into tack-like structures each containing 2 to 4 seeds. Seed nutlets disperse by adhering to tires, shoes and clothing of people, fur, feathers, and feet of animals. These burs can injure people and animals and can damage bike and car tires. Foliage is toxic to livestock, especially sheep, when consumed in quantity. The fruit is used medicinally in India. 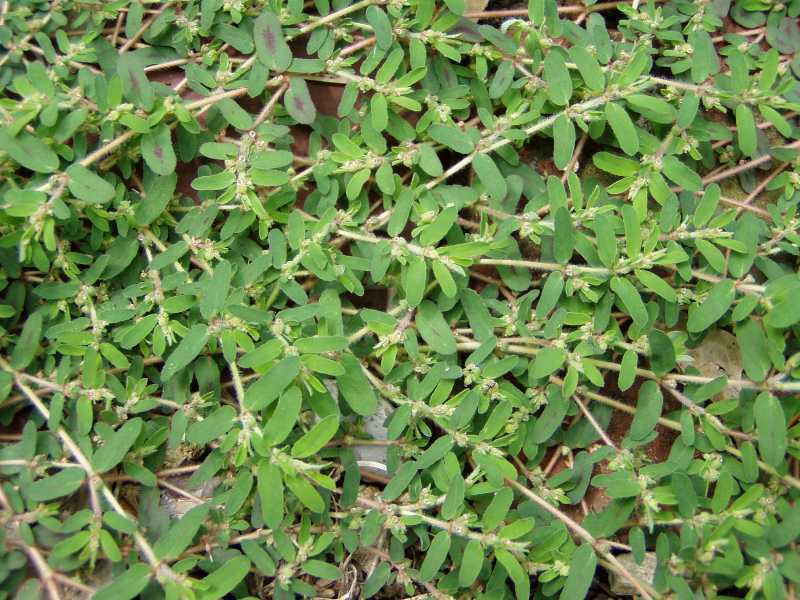 Purslane (Portulaca oleracea) is a prostrate mat-forming summer annual that can reach up to 24 inches long. 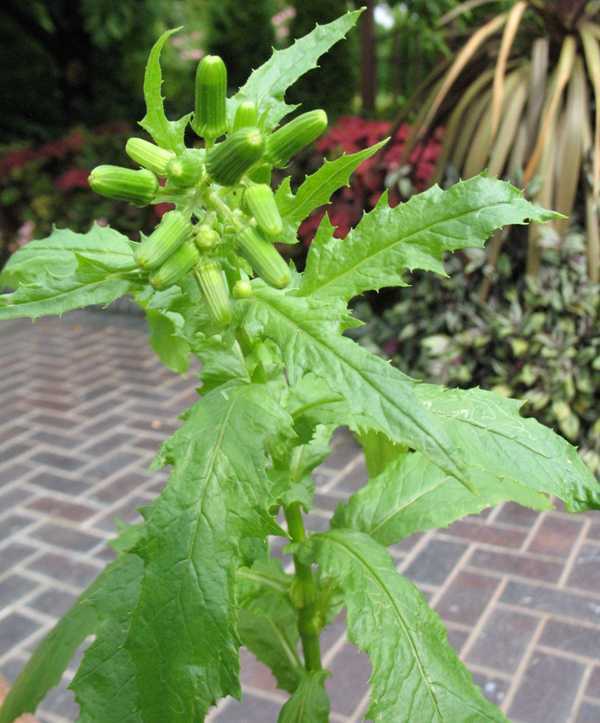 It has multi-branched red stems that root at the nodes wherever they contact the soil surface. 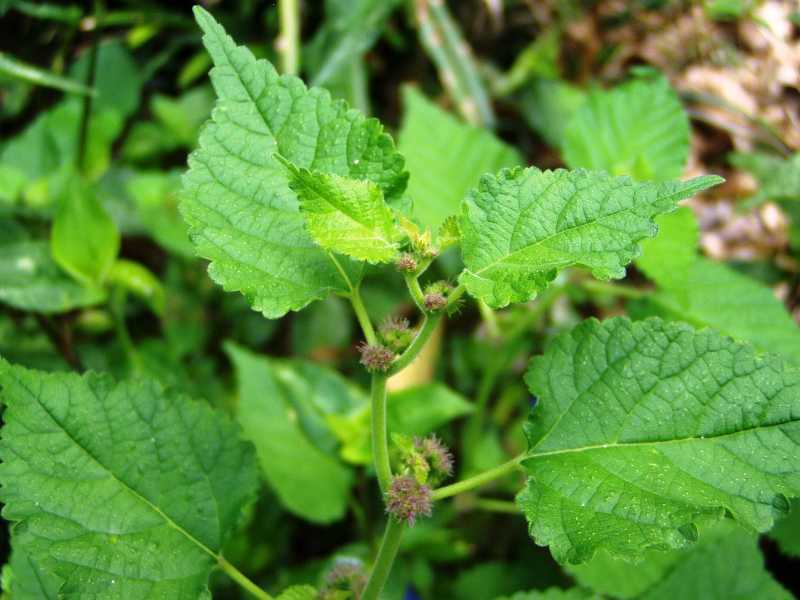 The smooth, thick, fleshy leaves are usually alternate and are often clustered near the ends of the branches. The entire plant is very succulent and resembles a jade plant. 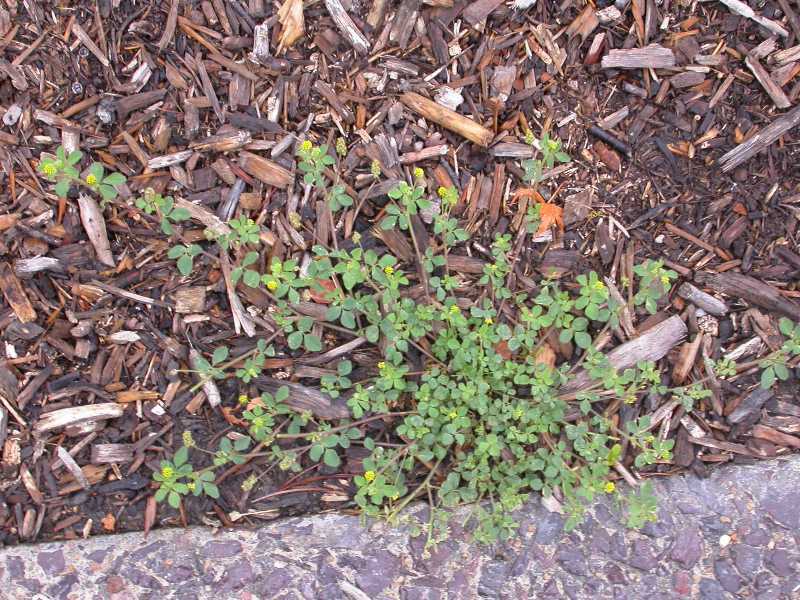 Purslane is common to disturbed soil, new seedlings, sidewalk crevices and mulched planting beds. It prefers high light and warm conditions. This plant reproduces by seeds that are formed in a capsule with a lid that flips open in the spring. Solitary yellow flowers with 5 petals will only open with sunny conditions from May to September. 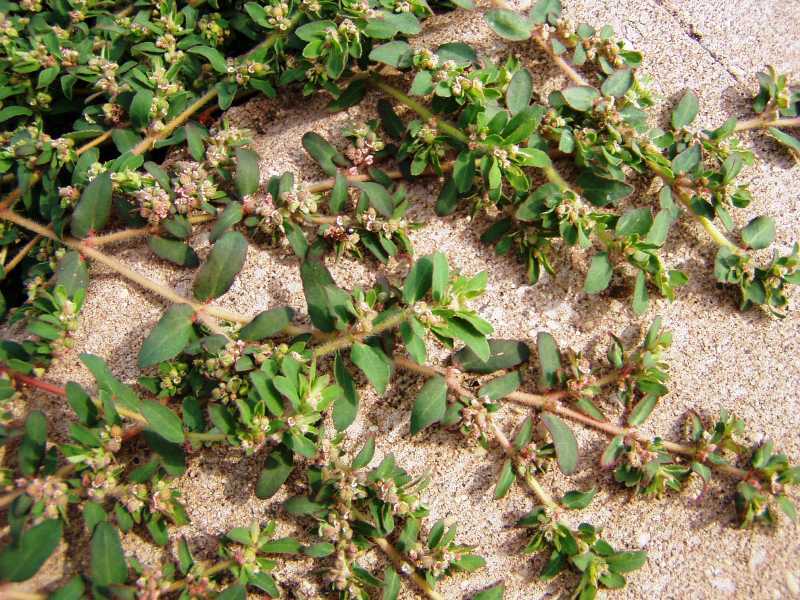 Purslane’s use as a medicinal herb to treat dysentery, headache, and stomach ache dates back 2000 years. 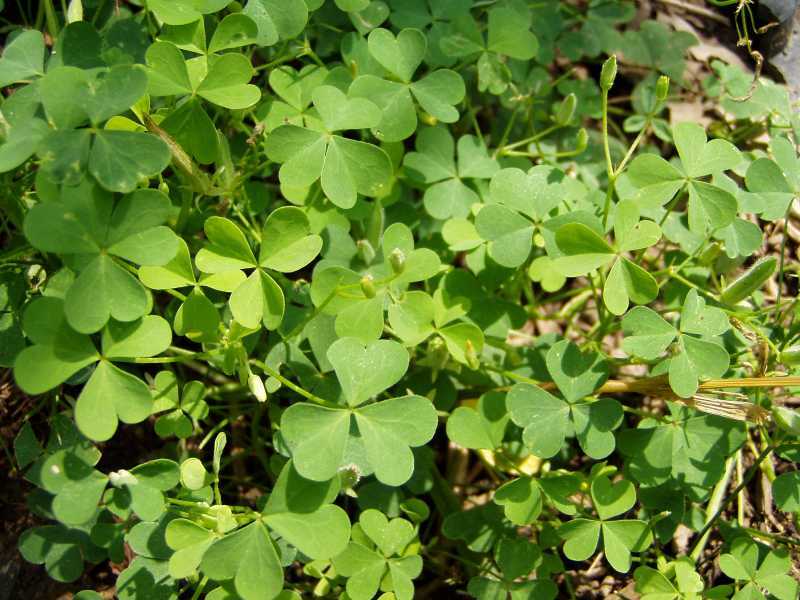 It was also used as a salad green by the Australian aborigines, by the Chinese, French, Italians, and the English. 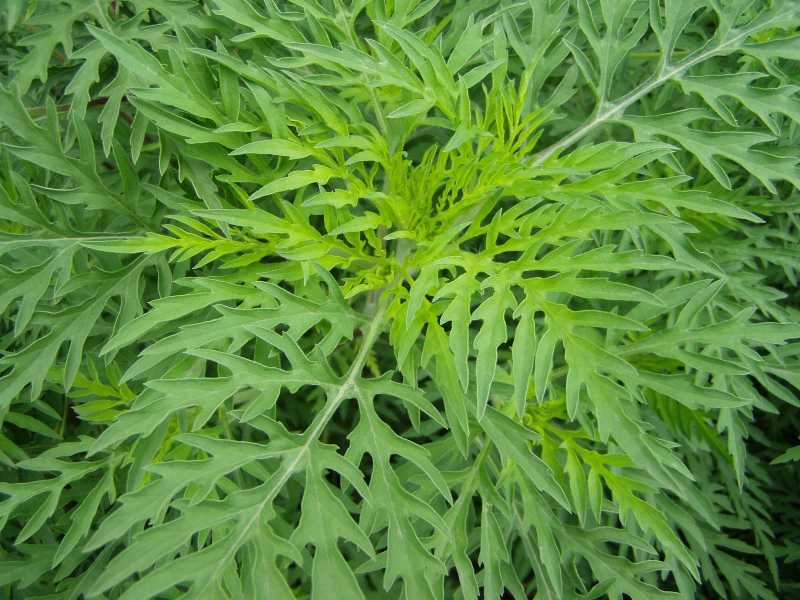 Ragweed (Ambrosia artemisifolia) is a summer annual that produces pollen. One weed equals 1 billion grains of pollen, 100 million tons of pollen are produced per year. It grows up to 5’ tall. Opposite leaves are egg-shaped in outline and once or twice compound (pinnatified), they are hairy on their upper surface and margin. 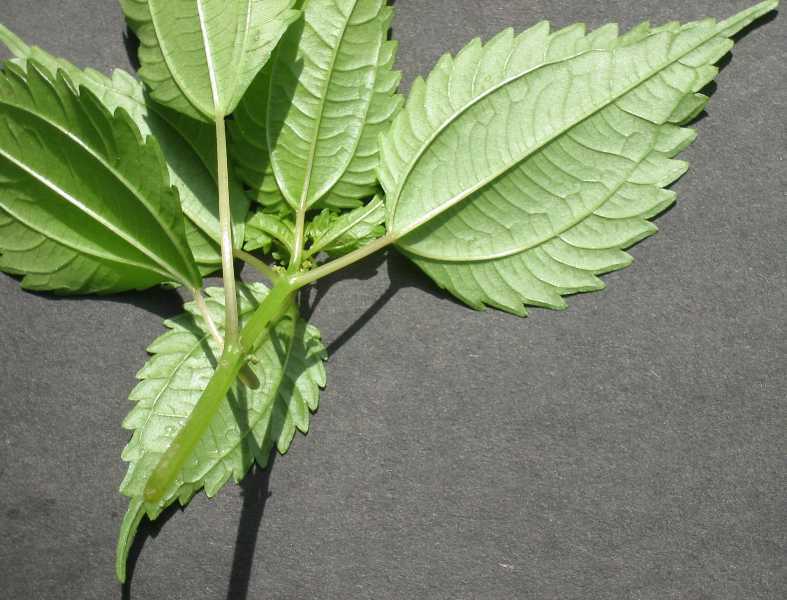 Leaves can be up to 6” long, The erect stems have long rough hairs. The fruit is an achene, which resembles a queen’s crown. It has a shallow taproot. 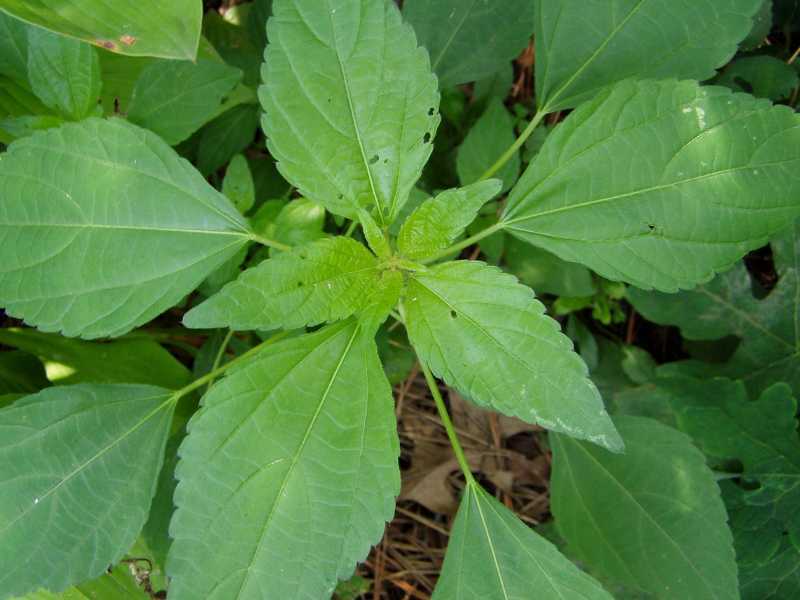 There is a giant ragweed (Ambrosia tridida) which grows up to 14’ high. 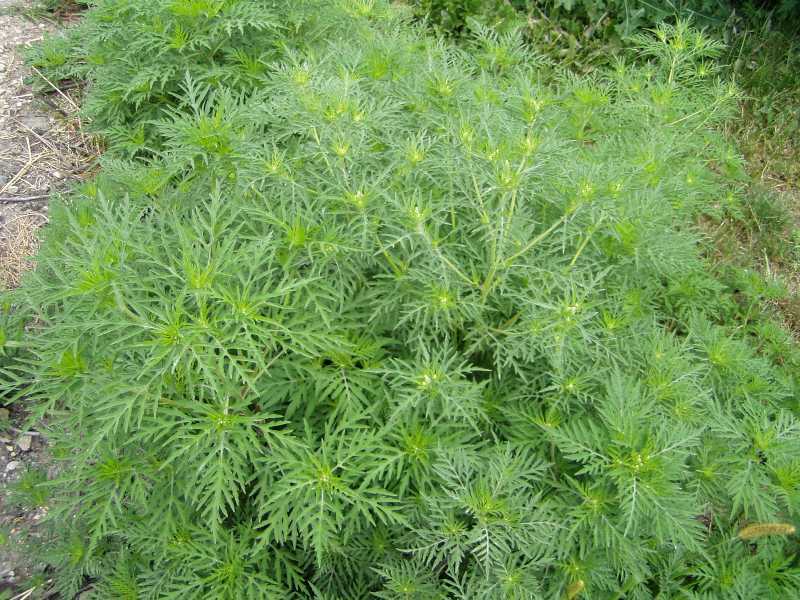 No animal eats ragweed. Prostrate spurge (Euphorbia supine) and spotted spurge (Euphorbia maculate) are summer annual weeds. Spotted spurge has a more erect growth habit than prostrate spurge. 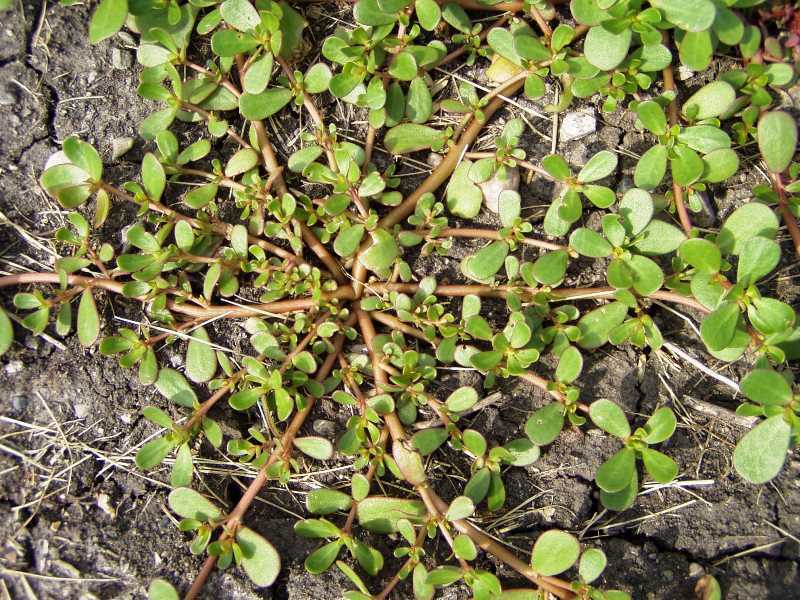 Prostrate spurge forms dense mats with its stems radiating out from a shallow taproot. Both species have similar leaves, which are small and oblong with an irregular maroon to purple spot in their center. However, the leaves of spotted spurge are slightly larger than those of prostrate spurge. Both spurges have leaves that grow opposite on the stem, but spotted spurge has fewer leaves per stem. 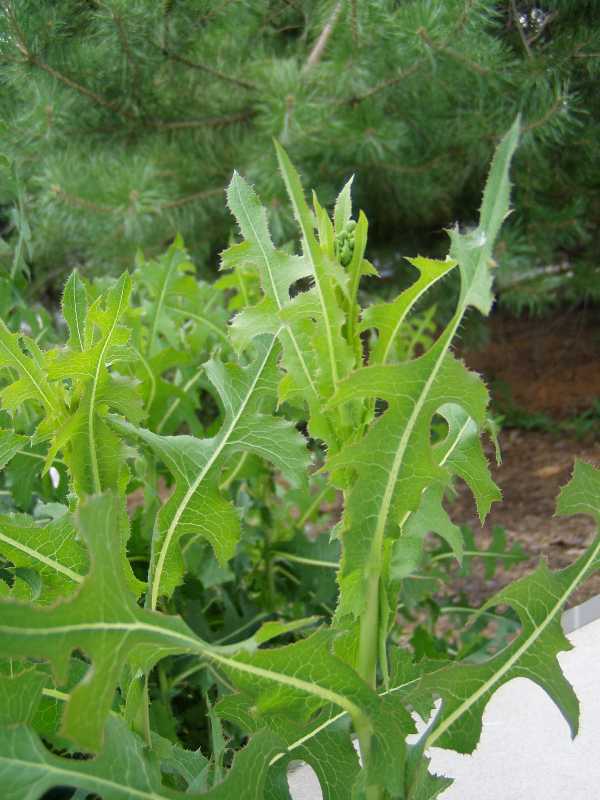 When the leaves of both spurges are broken or injured they emit a milky white sap (similar to dandelion). Prostrate spurge roots at the nodes, but spotted spurge does not. Both spurges reproduce from seed. 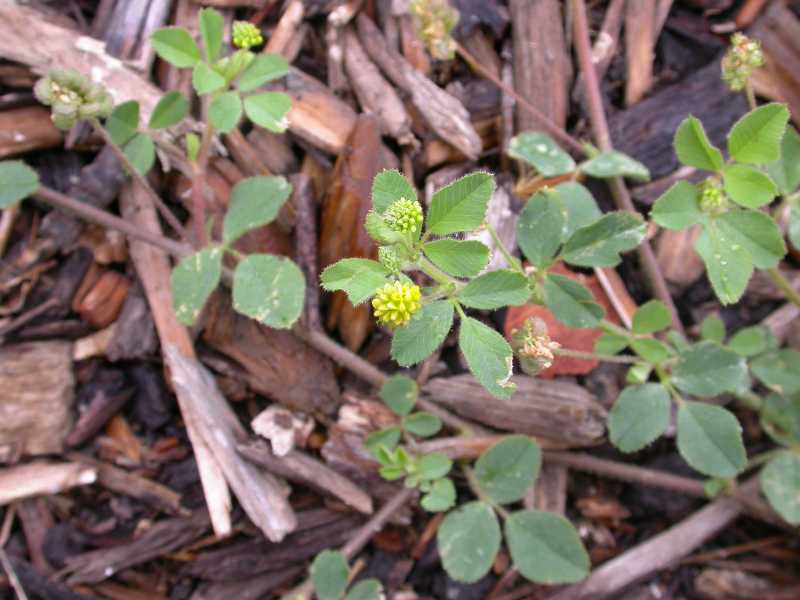 The flower of spotted spurge is small and green in color. Prostrate spurge has inconspicuous small, pinkish white flowers in the leaf axils. Vervain (Verbena officinalis) is known as the herb of enchantment. It is used medically in 30 complaints. Supposedly vervain staunched the wounds of Christ on the Mount of Calvary. It has a slightly bitter taste and it has no scent. Vervain is rarely perennial, the leaves are numerous, opposite, lanceolate to ovate ½ to 3” long. It is pinnately toothed, it can have 3 lobes, with the center lobe larger than the others. The leaves are hairy on both surfaces. The flower is a dense terminal spike 1-8” long, usually ascending. 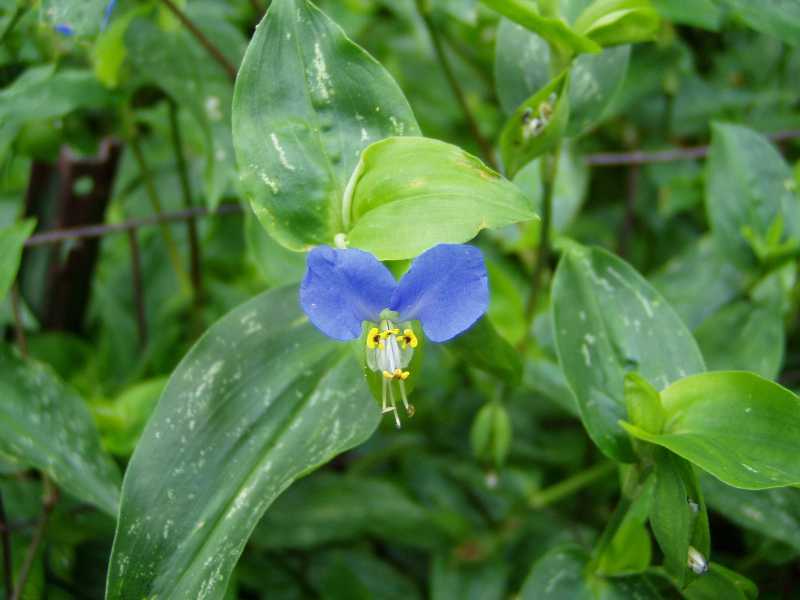 The flower is blue or purple with 5 lobes, the tiny flowers are almost hidden by conspicuous hairy bracts. 1. 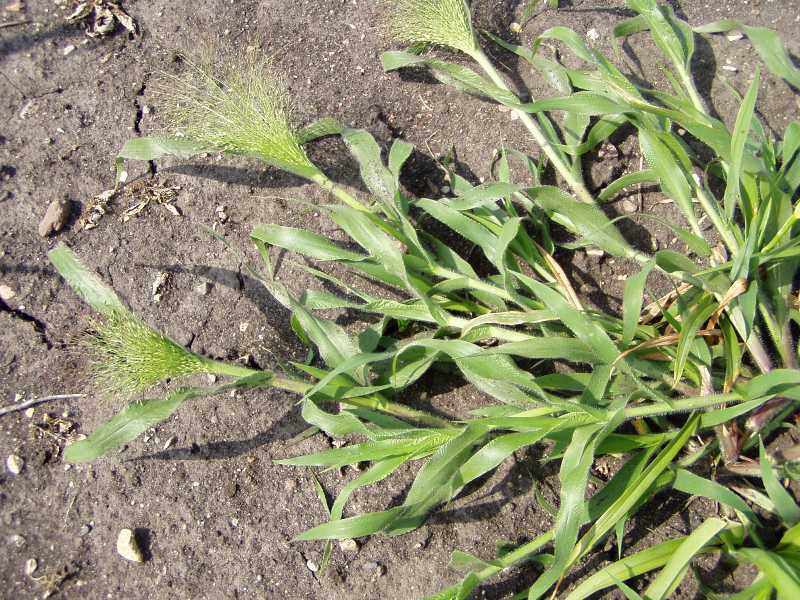 Use good cultural practices to prevent the spread of summer annual weeds. Maintain a dense actively growing turf through proper mowing, fertilizing and watering practices. Most lawns should be cut at least 2 inches or higher. Watering deeply (4-6 inches) just before the turf begins to wilt is a sound approach. Frequent light watering promotes weak turf with shallow roots which are more susceptible to insect and disease attacks as well as weed invasion. Complete soil testing is the key to proper liming and fertilization. Cultural practices for the control of summer annual weeds are aimed at shading and crowding the young weed seedlings by producing a dense sod. 2. Dig up the weeds. 3. Coring and traffic control reduce compaction and encourage desirable turfgrass growth. Mulch flower beds to control weeds. 4. Use chemical herbicides. 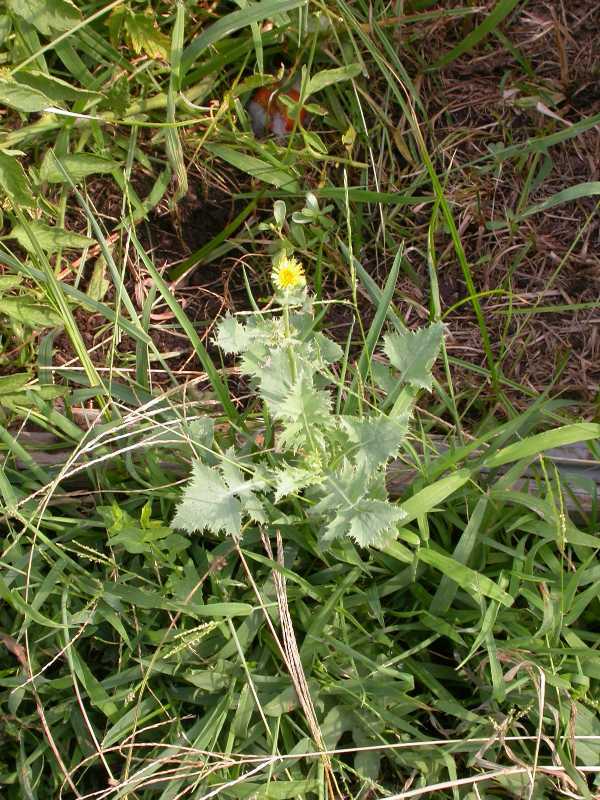 Use a post-emergent herbicide when the weed is young, usually three to four leaf stage. 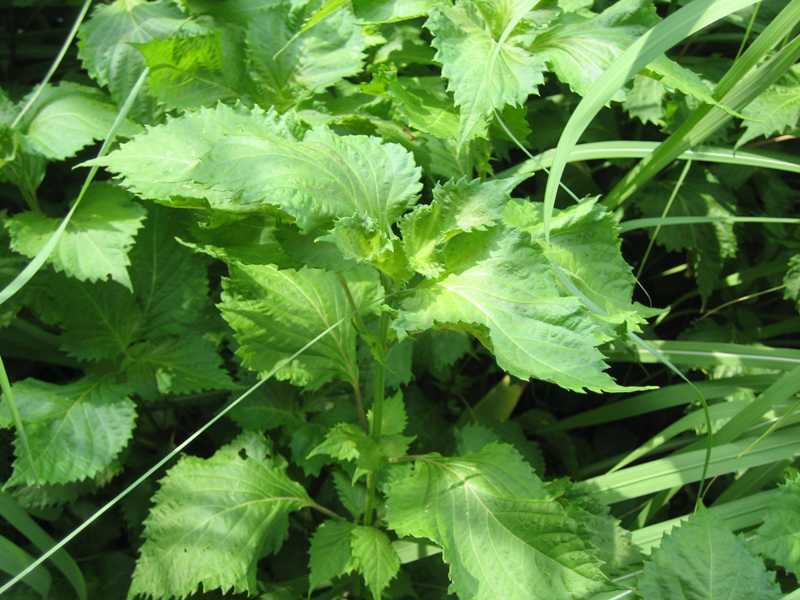 It is best to control summer annual weeds in late spring or early summer when they are young. They are easier to control at that time and both warm season and cool season turfgrasses have a greater chance to recover the areas previously occupied by weeds. There are also some pre-emergent herbicides available which form a chemical barrier in the soil and prevent the weeds from emerging. Check herbicide labels to verify that the herbicide you have chosen is effective in controlling your problem weed and when and how to apply. Strategies 2 and 3 are strictly organic approaches. Strategy 1 could be considered an organic approach if an organic fertilizer is used. Fireweed flower buds, Erechtites hieracifolia, open only slightly wider than this even in full bloom. Also called burnweed or pilewort. Fireweed, Erechtites hieracifolia. Also called burnweed or pilewort.